Our buddy Dr. Rob is trying to get his readers to write a limerick to obtain the prestigious Golden Llama Award. As you can see above, I have bestowed this distinction on myself - just for being subjected to this "embarrassment" (hehe - I was expecting at least a mention of Nantucket or something like that - HA!). Anyway, definitely check out his comment section on this post. There are a few pretty creative rhymes over there. But, I'm like Dr. Val when she said, "Just can't do it." Word up, Dr. Val! In the midst of all the holiday stuff going on, I forgot to mention this last week. I've been a fan of the Medgadget Medblog Awards ever since I first started blogging over 2 years ago. 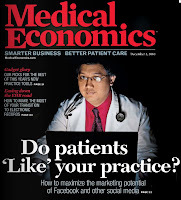 In those early days, two things which really made me feel like a "real" medblogger were being listed on blogrolls (which I already talked about here - great discussion over there BTW) and being nominated for Best New Medical Weblog in 2006. I didn't win, but I did my best to try to campaign for the win. Now, I didn't win (don't know why - hehe), but that was a fun process to be a part of. Last year, I asked not to be nominated. I really didn't feel I did that good of a job with my writing. Instead, I interviewed Nick Genes on the show about the awards. And, even had the creators of the Medgadget blog themselves on the show to talk about the awards. That was fun. This year, nomination close this Wednesday, January 31st, 2008. My blogging this year has been very minimal, so I definitely should not be nominated (and don't want to be nominated) this year. But, if you haven't already, I encourage you to check out the list and make your nominations. The categories include the following: Best Medical Weblog, Best New Medical Weblog (est 2008), Best Literary Medical Weblog, Best Clinical Sciences Weblog, Best Health Policies/Ethics Weblog, Best Medical Technologies/Informatics Weblog, and Best Patient's Blog. Finalists will be announced on Monday, January 5th. Voting will be from January 6th until 12 midnight ET on Sunday, January 18th. The winners of this year's awards will be announced on Friday, January 23rd, 2009. The nominations lists are getting pretty crowded. So, get those additional nominations in today. Good luck to all those nominated! This weekend has been ok while on call (I know I'm probably jinxing myself now). I've been meaning to edit my blogroll for a long time now. I've been putting it off for a while, because to go through this list just takes a long time. When I was going through my list today, I deleted about 20 links because they are no longer blogging. Everyone in New Media Medicine (ie- medical blogosphere) knows that GruntDoc has his occasional "DeadBlog" post where he deletes links every so often. I remember back when I first started blogging. I was trying to figure out who were the most popular med bloggers. One of the ways was seeing the blog linked on everywhere. And, my goal as a new blogger would be to get on these famous blogger's link list. I was so happy when I started seeing my link on other's blogs. Now, with it being two years later, I wonder whether people use the blogroll or the link list to determine popularity. In my opinion, the blogroll has become a little old fashioned. What I see out there are things like being followed on Twitter and other social networking sites rather than the blogroll. What do you think? Is the blogroll as prestigious as it used to be? I admit that I didn't know too much about these Shorty Awards until I received this tweet from the shorty awards site. According to the site, these awards "honor the best content producers on Twitter. Nominations close on December 31st. Apparently I received two nominations in the health category. Thanks to those who nominated me. I really appreciate it. On this Monday before Christmas, I would like to spread some Christmas cheer to everyone out there this morning - especially, since it feels like -20F with the winds this morning. Usually, this is a good day to stay home. But, since Dr. Santa has to save lives (HA), I took the reindeer and sleigh to the hospital (tough to find a parking spot) and to the office. What would you say if I walked into your hospital room or office exam room looking like this on this cold morning? Leave your comments (all comments welcome) below. Oh, by the way, there's only three days left until Christmas. Happy Monday! I wanted to thank my "secret" guests who were Kat and Kim. At the end of my show, my computer froze up and Kat had to close up the show for me - and she did a fabulous job! Also, our buddy Kim cut her foot right before coming on the show. Kim came on and recited a poem to me and did a great job on the show. Then, as you could see from her twitters, she did go to the emergency room and receive six stitches. Thanks also to those who called into the show. Marq called in and gave a sang a little parody song for me - that was nice of him to do. Also, Sunny, RevRockDog, Annie & Burl also called into say hello and make the show even more entertaining. I am still flattered that people would write a poem or write a song for me - very much appreciated. So, this is the last Doctor Anonymous Show of 2008. I can't believe this year went so fast. Just wanted to thank everyone out there who support my show, support my blog, and support me. It is all of you out there who keep bringing me back to try to do more to entertain and inform you. I'm really looking forward to 2009. I have some grand plans on how to make the show bette and how to make the blog better - all while having fun in the process! Update: It's been a very frustrating last six hours. I've been trying to upload a video post to the viddler site, but for some reason, it's not going through. That's why the video post is initially not here. I'm going to try to continue to try to post it through the day today. Yeesh! Update 2: Was able to upload to YouTube. Let me know what you think of the video quality. I'm still trying to upload to Viddler. But, always wanted to try YouTube. Not sure if I like it as much. Update 3: I know all these updates are really geeky, but, it's been interesting experimenting with other video sharing sites. Viddler is still not working for me. Thanks to T-rave, tried out Blip.Tv. And, I'll let you be the judge verses YouTube (both videos above). Update 4: Ok, last update on this issue. It is now 18 hours since the initial post, and the Viddler post finally came up. I compared Viddler, Blip, and Youtube videos and I'm deleting the latter above. As you can see in the video above, I have totally lost my mind. I can't believe that it's only one week until Christmas. Are you into the whole Christmas thing, yet? I know not a lot of people are. Well, have I got the prescription for you. 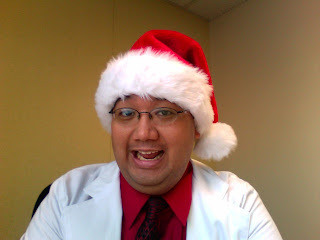 Why not join me for The Doctor Anonymous Christmas Show. Do you have favorite Christmas music, movies, and TV shows? Why not call into the show and let's talk about it! We also might share some childhood Christmas memories. Did you see my gift to all of you earlier this week? What were your favorite Christmas gifts when you were a kid? We'll talk about that - and I'll also have some mystery guests. So, you don't want to miss that! If you do listen live, you can even take part in the chat room. It is truly "The show within the show." You can even call in and say hello. A great opportunity to interact with medbloggers you've only read about. And, you will be able to see me on the live webcam during the show! See you for the show! Are you looking for a date on New Year's Eve? Well, why not hang out with me live on the internet! What am I talking about? Cliff Ravenscraft is someone I met at Podcamp Ohio this past summer. I even did an interview with him. If you haven't already, check it out on my viddler site to learn more about Cliff and his podcast network called the Generally Speaking Podcast Network, or GSPN.tv. Anyway, Cliff is going to do something that I could not even think of doing. He's going to podcast for 24 hours in a row on New Year's Eve. How crazy is that? Actually, I have always wanted to try that. I mean I know all about sleep deprivation, and I think that I would have fun at least trying it out. Join me on the GSPN Marathon Podcast from 9:00-10:00pm Eastern time on December 31, 2008. If you have skype, you'll be able to "call" in to the show and talk to me and Cliff. I'm hoping that some from the Dr. A community will call in to introduce the GSPN community to what we're all about. This should be a fun show! It's going to be even more fun, because I'm on call that night. Hopefully, my pager won't go off to many times during our conversation. Finally, I did want to talk a little bit about GSPN itself. Cliff produces a bunch of podcasts in the areas of technology, entertainment, family and faith. There are just too many for me to list here. In addition, Cliff has been podcasting for three years, and even left his former job so that he could pursue is dream of working in podcasting/newmedia full time. I very much respect that. See you New Year's Eve! Ok, you're probably wondering what I was talking about on Twitter when I said something like, "My Christmas Gift." Well, it's the video above. And before everyone out there gets the wrong idea. The last part of the video above comes from the video vault of Dr. A. A few weekends ago, I was going through some old video tapes from high school. Back then, we had these bulky video cameras and either wanted to be a Hollywood filmmaker or a comedian. In the video above, you'll find old, old footage of me and my high school friends at an amusement park ride. We were on a "science" field trip in which we were given some physics problems to figure out during the course of the day. Above, we're in line for a lame ride, and we're just passing the time, just talking about nothing. I can't believe I wore those geeky glasses back then. You'll also see the Kent State University sweatshirt I was wearing as well. It was my dream at the time to go to Kent State, but that didn't happen. I lived at home and went to good of Youngstown State University for college. Also in the video above, you'll see the poofed out hair styles which defined the 80s - good stuff. Finally, you'll see some of the early glimpses of my comedic genius in action, even as a teenager - hehe. This video was so much fun to put together. I'm a little bit embarrassed to put this out, but I figured, what the heck. It's my Christmas gift to all of you. BTW, speaking of Christmas, join us for The Doctor Anonymous Christmas Show which will be Thursday, December 18th, 2008 at 9pm Eastern Time. We'll be talking about Christmas memories from childhood, your favorite Christmas movies, TV shows, music, and whatever else comes to mind. I'll also be joined by a couple of mystery guests. See you for the show! Angelo also gave us an update stating that his wife Heather is due with their first child in the middle on January. I encourage you to check out his blog to see a picture from a recent baby shower. Angelo also shared his experience at the recent Podcamp Pittsburgh meeting. Following the interview, I was happy to welcome Trauma Junky who not only listened to the show for the first time, he also called into the show to talk about respiratory therapy and his blog called Surviving RT School. TJ even wrote a post about being on the show. Thanks so much! I encourage you to check it out. The post is entitled, "Does this makes me famous?" Finally, want to give a shout out to one of my new peeps named "T-rave." He talks about tech on his site and also on Twitter. He also listened to the show for the first time. And, what does he do? He makes a video post about it. Thanks so much! You are the man! I'm quite excited to kick off the PodCamp Ohio 2009 planning on the Doctor Anonymous podcast. We have the technical issues ironed out from the first PodCamp, so this next year's PodCamp Ohio podcast will be much more entertaining rather than technical. We can discuss some ideas what we want to do with the next PodCamp Ohio. We can also discuss next years location which will be Mendenhall Lab at Ohio State University. I'll [be] posting some pictures from the building on flickr and send the link to the Google group. All of the rooms available to us at Mendenhall Lab are at minimum the same size as the medium size rooms from last years PodCamp Ohio. In addition to this topic, I wanted to mention Blog World Expo 2009 which will be October 15-17, 2009 in Las Vegas. There has been talk of a possible health/medblogger programming track. Well, it was learned this week on the BWE blog, that BWE will be merging with the New Media Expo, which will make a huge event next year. Why is this important, because this will be THE national conference for blogging & podcasting. I'm motivated more than ever to go to this conference! What else will we talk about? Who knows? This week, The Doctor Anonymous Show is going to be more new media as opposed to medical. (see video post above) What do I mean by that? Well, we're happy to welcome our friends from Podcamp Ohio to the show this week. In my own mind, I have designated the Dr. A Show as the "Official/Unofficial podcast of Podcamp Ohio" (hehe) I think every month until Podcamp Ohio 2, the show will be giving updates on the event. For those of you who don't know, Podcamp Ohio 2 will be Saturday, June 20th, 2009 at Ohio State University. If you didn't happen to see how much fun we had last year, I encourage you to check out a bunch of videos that were shot at the 2008 event. Angelo, who is the lead organizer of the event, will be our guest this week. He'll be giving us an update on the most current information Podcamp Ohio 2. So, join us for the next exciting episode of The Doctor Anonymous Show which will be this Thursday, December 11th, 2008 at 9pm Eastern Time on BlogTalkRadio. When I was checking out the iTunes store last weekend, I was pleasantly surprised to find the image above. What is it? 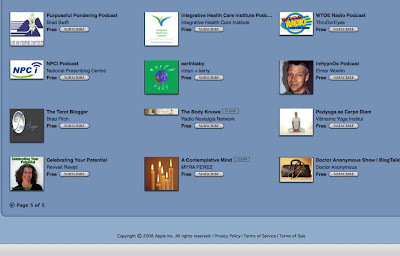 Well, it's The Doctor Anonymous Show in the "New and Notable" section of iTunes. Of course, the show is in the podcast section of iTunes. But, it's under the "Health" category and "Alternative Health" sub-category. Now, I had no idea that the show was going to be on iTunes. I had nothing to do with that. 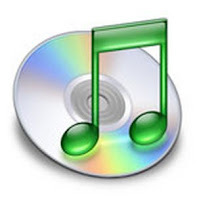 I would imagine that BlogTalkRadio makes a feed available to iTunes and that's how it got there. And, there is no "medicine" category at BTR, so that's probably how the show ended up in the iTunes health category. 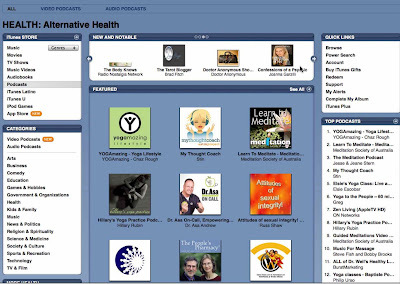 As I was exploring more the "Health" podcast category of iTunes, I saw the image above. It is the "Featured" section. And, do you see the lower right corner of the graphic above? Well, it's The Doctor Anonymous Show featured on ITunes! Now, granted, it's on the last page of the "Alternative Health" section, but I'm featured, baby - at least for now. So, here's my plea. For those of you who enjoy The Doctor Anonymous Show, I encourage you to subscribe to my iTunes feed. Also, please leave me a review over there on iTunes. I hope to climb the ladder of popular podcasts over there on iTunes. And, I can do exactly that, with your help. Thanks so much for your continued support for the show! Recently, there have been some mentions of Zippy and where the heck is he at. Well, I did manage to find him in Spain - with of all people, our blog buddy - Crzegrl. As the people from Change of Shift know, she was in Barcelona last month, and guess who went with her? In the video above, Zippy is enjoying the L'aquarium Barclelona. Although, he did look a little intimidated. I'll let you judge for yourself. This also gives me the opportunity to again mention the silent quilt auction by Ramona which I mentioned previously. The latest bid is $300 and the bid will be going to The Childhood Brain Tumor Foundation. And, if you can't bid, consider giving a donation to this worthy cause. Thanks to Enrico for being a fabulous guest host for Show 61. (See the video above) I just listened to the archive, and it sounded like everyone had a good time. I also wanted to thank the people that called into the show including Dr. Val, Ramona, MJRN, Bongi, and Vijay. I also heard that we had a pretty good crowd in the chat room for the show. Grand Rounds always brings a great discussion. Although I wished that I could have watched the show live, from listening to the archive, I could really tell that the panel and everyone in the chat room were helping Enrico out during the show. There was even a point where, I think, Enrico's skype cut out - and the panel just kept the discussion going. I think possibly this is a new BTR host in the making. I was able to catch Enrico's after show when I got home last night. And, that was a good time, too. I so, so, so, so much appreciate everyone's support of The Enrico Show and my show in general. The community that we have connected around the world continues to amaze me. Have a great weekend everybody! Update: Below is Enrico's video wrap-up. I'm jealous of the HD quality video. Maybe it's time for me to get that HD cam, ugh. Enjoy the smoove music as Enrico gives his commentary. Great job! The Doctor Anonymous Show is happy to welcome our buddy Enrico to the guest host's chair this week. If you didn't already know, I was unavailable to host the show this week. And instead of canceling the show, Enrico graciously stepped up to the plate to help me out. Thanks so much Enrico. Enrico was the host of Grand Rounds 5.11 this week and did a fine job at that. Scheduled to be on the show to participate in a roundtable discussion will be Val Jones, Ramona Bates, Mother Jones, and possibly Bongi. Join them as they talk about ME (hehe), Grand Rounds, the medical blogosphere, new media medicine, and whatever else comes up. If you do listen live, you can even take part in the chat room. It is truly "The show within the show." You can even call in and say hello. A great opportunity to interact with medbloggers you've only read about. And, you will be able to see Enrico on the live webcam during the show! See you tonight! Emblematic of soaring health care costs, which are projected to reach $3 trillion by 2011,is the nationwide crisis of emergency department overcrowding. More than $18 billion is wasted annually on unnecessary visits to the ER,with volume rising by 32% and wait times almost doubling to one hour during the past decade.Relieving this strain will be critical to any health care reform. Contrary to popular belief, it is not just the uninsured who are utilizing emergency services. A recent study in the Journal of the American Medical Association showed that patients with health insurance were primarily responsible for the increase of emergency services over the past decade. Lack of access to an available doctor is the major reason. He analyzes the issue of emergency department crowding from a primary care perspective. What's the answer? Well, you'll have to read the article yourself to find out. Great job as always Kevin and thanks for keeping the primary care point of view out there on the national stage. Death and Transfiguration is a “tone poem,” literally, a musical literary depiction. In this case, it is of a dying artist on his deathbed in his last moments, and what is experienced up to, including and after death. A patient in a bed knowing it can be the end is certainly scared, and perhaps even confused. Doctor Anonymous shares his thoughts as part of yesterday’s official observance of World AIDS Day. It is, as he pointed out, the 20th anniversary of the event, and we have made incredible strides in that time. I admit that I haven't mentioned GR in a while. I have to admit that I've been a lazy medical blogger in that I haven't written anything for this fabulous blog carnival in a while. If you don't know what Grand Rounds is, it is a weekly compilation of the best posts from the medical blogosphere that moves to different sites each week. And, who doesn't like reading about medicine and science? Next week, Grand Rounds moves to the blog called "Sharp Brains." For those of you who don't already know, our blog friend Dr. Ramona Bates, in addition to being a world-class surgeon, is also the creator of elaborate quilts like the one seen above. The inspiration for this quilt comes from our favorite traveling crustacean who is, of course, Zippy the Lobster. Today, on Ramona's blog, Suture for a Living, she announced that the quilt above is being put up for auction for the charity called the Childhood Brain Tumor Foundation. The quilt measures 41 inches by 41 inches. For the story of the quilt and the rules for the silent auction, click on over to today's post called "Silent Charity Auction." This is a great quilt, by a great doc, for a great charity. Bid on it today! It'll make a great holiday gift!